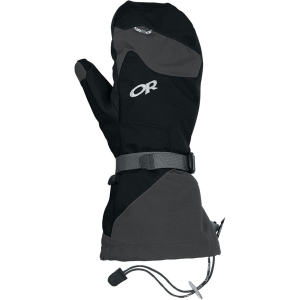 This mitten "system" (outer shell + removable liner) by OR has been a hand saver in many cold conditions in which I've used them. The overall quality and build of the finished product is excellent - I found no stitching errors, loose threads, etc. The ergonomics of the design are exemplary - I have no problems operating the wrist lanyards and cinch straps (tightening or loosening) once my hands have become "crab claws". 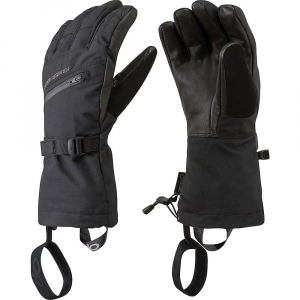 Additionally, it is very easy to maintain grip on standard trekking pole handles wearing these mittens. 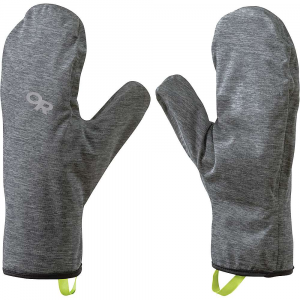 The inner mittens are fleece, and feature fold back finger and thumb covers which lock into place by two pairs of small but powerful magnets. To remove your right hand with the liner on it from the outer shell, simply grab the tip of the outer shell with your left hand and pull your right hand out (the liner is held in by two short sections of hook-and-loop material). After choosing your position for camp and clearing away the snow, this fast access to your fingers is absolutely critical to get the 4 season tent up quickly. The liner feature is also very helpful in maintaining the correct body temperature - as you heat up, shed the outer shell, fold back the liner flaps and expose your hot skin for a little bit. The outer shell is very heavy duty and appears to be made of heavy coated oxford cloth (typical pack material) and thick rubberized cloth over the palms, inner fingers and inner thumb area. 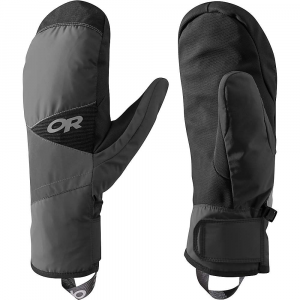 I have never had any issues with my hands getting wet from external water sources in these mittens (I have even tested the waterproof design in the kitchen sink and have found no leaks whatsoever). As far as warmth is concerned, OR's Meteor Mitts have never let me down. My latest venture included exposure to about -45 F temps with wind chill, and my hands remained very warm even while standing around for a bit. I should add that I have notoriously cold hands, so I actually need more than the average person to keep my hands warm. I broke a half a star short of the full five star mark for these only because the fleece liners appear to be getting a bit nappy with age (I think this is due to the position of the hook-and-loop tabs that mate the liners to the shells - basically taking you hands in and out eventually "scuffs" the fleece). Note this hasn't detracted from the functionality of the system, just bugs me a bit. 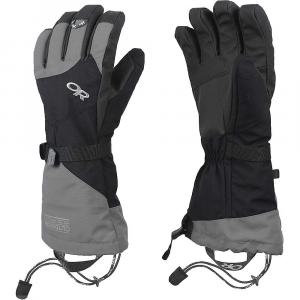 Overall a fantastic set of winter hand protection! I would absolutely recommend these to anyone, and I am satisfied that there is nothing better for the money out there! Comes with internal convertible fleece mitten gloves that I do not like, but will work well. 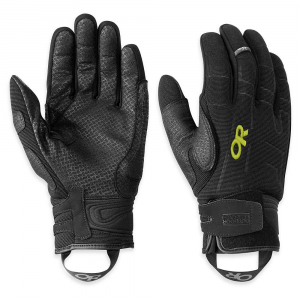 I substituted them with the Marmot Windstopper Convertible Gloves, with some light wool lined gloves under them. I must say, this system alone will keep your hands warm without the shell gloves 95% of the time. When you get to the summit and the wind is hitting you at 25 MPH and its -35°, you'll be happy you had these. They breathe well, but keep all water and wind out. They secure with pull cords that can go right around your wrists or neck for quick grab. The cuff adjusts around your wrists so as to keep the snow and wind out to an extra degree. I would like to see these come with a nose drip fabric on the forefingers, and for them to use a higher quality convertible liner glove. This is why I give the product 4/5 stars. The flip top liner is unique. Instead of revealing a fingerless glove (to the knuckles), the bottom is just like if you cut the mitt in half. This makes the fingers warmer with the top on or off. Inner part of the shell can pull out, hard to put back in. This mitt is similar to other mitts I have bought for Nordic skiing, some from OR. The main difference is removable inner mitt's top can be flipped back to let you use your fingers. You can retract your fingers into the bottom part for warmth, like between bites of food, rather than putting the top back on and off. Since the bottom of the fingers are together they are warmer than similar fingerless (half) gloves with a mitt top. I removed the magnets, the top stays open enough without them. They can throw a compass off , even permanently reverse the polarity. They also stick to pots while cooking. This is easy to do just cut open the small patch that is sown over the magnet. For me this was easier than removing stitches, and cutting the patch will not damage the fabric of the main mitt. 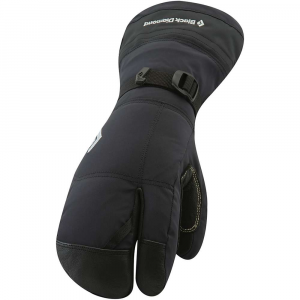 These mitts are not warm enough for downhill skiing where you use a firm grip on the pole. I would not use them for Nordic skiing either at anything like 50 below. The only other problem with these mitts is the inside of shell can pull out , which means you have to stuff it and the liner back in, including the thumb part. I have found this can be a real problem if one has to take your gloves off in awkward places, like after a fall between trees. I tried sewing this fabric at the top of the mitt. But this would effect its water resistance. The shell can be hard to squeeze your hand into, even if you cut off the outside strap to tighten this even more. The size large shell and medium mitt works better for me if I remember right. The shell or liner can be used separately. Despite the negatives, I have bought several pairs of these, after the shell wore out in the first pair.